The general word ‘committee’ has taken on an interesting and sometimes joke-like perception in recent years. It is frequently used to mock how slowly groups make decisions and what the muddled outcome will likely be once a mass of people all incorporate what they believe are their absolutely critical ideas. Dating back to 1952, the saying that, "a camel is a horse designed by a committee" even has its own Wiktionary page with the explanation, "[this is] an expression critical of committees - or by analogy, group decision-making - by emphasizing the ineffectiveness of incorporating too many conflicting opinions into a single project. In this figure of speech, the distinguishing features of a camel, such as its humps and poor temperament, are taken to be deformities that resulted from its poor design." Comical, yes... but there is more than meets the eye with this explanation - supportive of the reasoning for creating smaller, more focused groups, to more effectively and efficiently work through challenges as well as proactive undertakings. Board Committees are designed to serve this purpose. Conversely, to have an entire Board work through all issues and endeavors creates a fractured environment that undermines the purpose of the Board by making it a tactical, instead of primarily strategic, group. Board Committees, dedicated groups led by a Board Member (Committee Chair), are designed to take on challenges that fit into their specific expertise and experience areas for offline discussion and solutioning. This approach, followed by a written report of findings, outcomes and recommendations sent out well in advance and to be voted on during a Board meeting, allows for the deserved structure and time for each topic to be properly addressed. This structural order is paramount in allowing for matters to be systematically investigated, vetted and presented in a logical and formal manner. Many Boards make the mistake of performing a Board Committee’s actions within the Board Meeting – this is improper Board decorum and drastically hinders a Board’s progress. 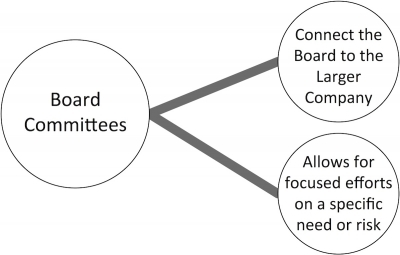 Properly constructed and operational Board Committees have an additional, yet frequently overlooked, benefit to the companies they serve – connecting the Board to the larger company. It is quite common for Boards to become insulated from the operational and technical challenges that a company faces. After all, a ‘noses in, fingers out’ approach, if not properly implemented or governed, can be somewhat limiting in rolling up true and useful information for the Board’s consideration, even when the CEO is doing their job properly. On a recent Board I was re-architecting for a large, well-known company, there was an obvious need to revamp not only the structure of their Board Committees, but also the expectations, processes and goals of existing and newly formed Board Committees. Of the many areas of focus, there was one step, of the many, I felt was worth sharing due to its amazing effect on both the Board as well as the overall organization. This Board required a full investigation and revamp of their 'Sphere of Influence' and 'Planes of Congruence,' which were directly hindering the effectiveness of their Board Committees. Without a doubt, these needed attention. In the meantime, priority was placed on getting both the Strategic Planning Committee and Governance Committee operational and adding value. This is where it gets interesting. When laying out the plan, the decision was made to include varying levels of company inputs by means of incorporating select company employees on Board Committees. This is an interesting and rewarding concept to consider. In the example company referenced, the VP of Services, responsible for carrying out the strategic plan through operational oversight, along with a Service Technician, were asked to join select Strategic Planning Committee meetings as informal advisors. They were essentially appointed and announced across the company as internal strategic advisors to the Board for a term of 2 quarters – and the resulting outcome was incredible. Not only did the Strategic Planning Committee get invaluable ‘boots on the ground’ viewpoints from a manager and technician in the company’s major revenue-generating division, but morale noticeably increased as measured by quarterly company surveys. Morale is a foundational element in supporting company Values & Culture – and of major concern to the Board. The Service Technician, who became somewhat of a company celebrity, had unknowingly addressed an age-old challenge of employees commiserating about what leadership ‘had decided’ or ‘done to them,’ and gave them a mutually valuable voice. Additionally, the Service Technician became a collection point of other employees’ ideas, concerns and innovations that could be represented through someone who fully understood the role and its inherent challenges. This Board is no longer viewed as a shadowy, secretive group, but a humanized, caring, knowledgeable and innovative instrument dedicated to company and employee success. Although not part of the original plan, we invited the VP and Service Technician to represent specific areas of the Strategic Planning Committee presentation to the Board - another win for the overall organization. Note that this approach is somewhat unconventional, but remember that we are addressing modern Board construction and operations, not old-school formats that can be limiting in their effectiveness and success. In addition to all customary duties, Boards also have an incredible opportunity to support and advance a company’s Values & Culture that should not be underestimated or ignored. What will you do to increase the value of your Board Committees?